My 429 CJ (ram air, auto, non AC) has a holley in place of the rochester as the PO couldn't get it to run properly. 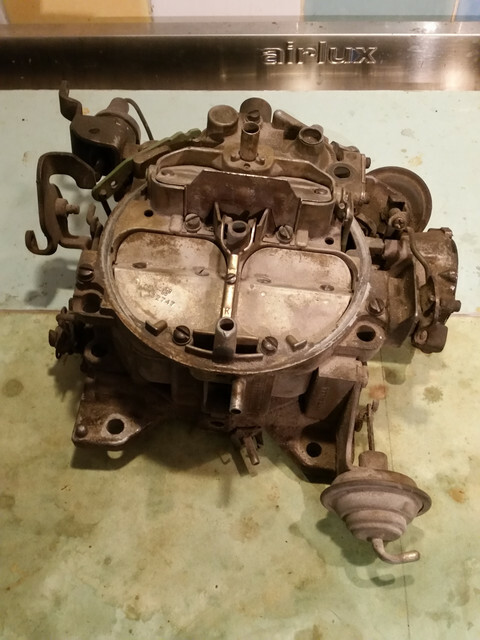 I've now, thankfully, received the original carb. It's been boxed up for the last 3 years, stored dry, though there seems to be a fair bit of rust and gunk on it. If it was anything like it is now when it was pulled then perhaps that's why it didn't really work. Does it look like all the original parts are with it? I guess it's going to need a full strip, clean and rebuild. I've got the 'rebuild and modify Rochester quadrajet carburettors' book by Cliff Ruggles on the way, need to get a rebuild kit of course and then my plan was to just follow what it says. Does this sound sensible? I've not rebuilt a carb before but can take whatever time it will take, there's no rush. I've come across a few video's on you tube as well that look like they'll be helpful too. If anyone has any other tips, tricks or suggestions they would be most gratefully taken. 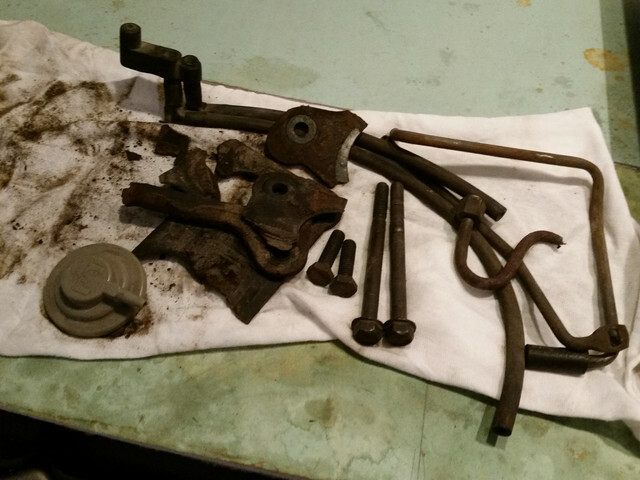 I would recommend a trip through an ultrasonic cleaner and soda blasting. It should clean up nicely. (10-29-2018, 09:55 AM)MikeGriese Wrote: I would recommend a trip through an ultrasonic cleaner and soda blasting. It should clean up nicely. Thanks Mike, however unfortunately I'm in the middle of nowhere in rural France so that might not be easily doable I'm afraid. I'll look around though, you never know! There are some dry ice strippers in the UK. Check on eBay under Lotus parts - I seem to recall seeing ads for services there. They have pretty low rates and quick turnaround. Take lots of pictures, strip the carb and send it off for a week. You can clean up the remaining parts while it is away. 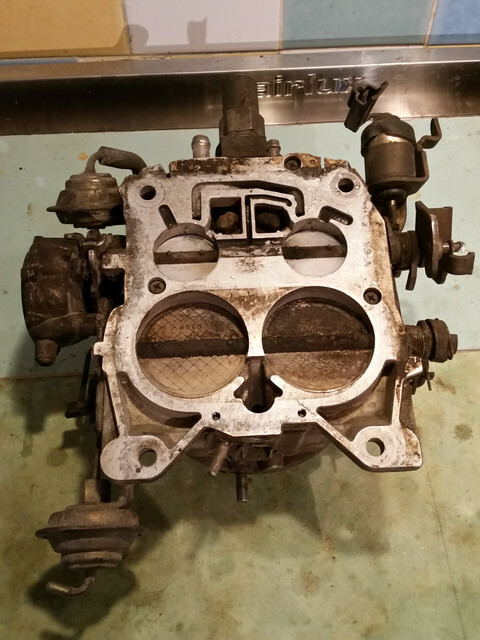 Do you have the divorced choke mechanism that sits in the well in the intake manifold? Cliff's book is a good guide for the rebuild. Don't do any of the modifications or "recipes" for improving the operation. Just do a stock rebuild. What is the casting # and mfr. date code on the housing of the carb? I have included a couple pics of mine to show the location of these #'s for reference. Unfortunately on mine in this pic., you can only see "550" of the date code in the bottom number. The camera angle failed to pick up the additional "3" in front of the first "5"; so that it should (and does) read "3550". This number equates to an approximate December 22, 1970 carburetor build date, which is very close to my car's actual build date. The number on top in my pic: "7042086" is the correct carb mfr'd for my car which is a J Code C-6 auto and A/C. Your's should read with an "8" instead of the "6" on the end of this number (7042088). This will tell you if you actually have the correct as delivered carburetor for your engine/car. With this info., you can then determine what parts should be on the carb you are showing here. OK after a bit of cleaning it seems that I don't, in fact, have what would be the original CJ Rochester carb. The number stamped into the body is 17059253 which means it is a 1979 M4MC quadrajet. It is made by Rochester, again stamped on body, and is 800cfm rather than 750cfm. It should have larger primaries as a result. I think that being a post 1975 carb means that it is the modified version, though I don't know what difference that would make. Again, from a bit of reading, it seems these are sometimes regarded as smog era carbs due to very lean fuel metering - would that be true? That's about everything I've found out so far. I presume it was fitted as a replacement due to some problem with the original quadrajet carb. Does the fact that I have this modified version of the quadrajet have an impact on trying to rebuild it and put it back on the car? Different rebuild kit I know. Would it have any advantages over the original, smaller quadrajet? Or the holley 3310 I now have on the car? (10-29-2018, 03:21 PM)7173Vert Wrote: What is the casting # and mfr. date code on the housing of the carb? I have included a couple pics of mine to show the location of these #'s for reference. Unfortunately on mine in this pic., you can only see "550" of the date code in the bottom number. The camera angle failed to pick up the additional "3" in front of the first "5"; so that it should (and does) read "3550". This number equates to an approximate December 22, 1970 carburetor build date, which is very close to my car's actual build date. Thanks for the suggestion, I would have assumed it to be the original CJ carb, however sadly it's not, still a Rochester quadrajet but from 1979.